It was late in the afternoon, you know, that time when the caffeine level has hit critical and the only way you can concentrate on the rest of the day is the promise you’ll be going home soon. The person sitting in front of me was a new patient, a professional young woman in her late 20’s, of Pakistani descent. She wasn’t keen to discuss her problems, but she didn’t know what else to do. After talking to her for a few minutes, it was fairly obvious that she was suffering from Generalised Anxiety Disorder, and I literally mean suffering. She was always fearful but without any reason to be so. She couldn’t eat, she couldn’t sleep, her heart raced all the time. I was actually really worried for her. She let me do some basic tests to rule out any physical cause that was contributing to her symptoms, but that was as far as she let me help her. Despite talking at length about her diagnosis, she could not accept the fact that she had a psychiatric condition, and did not accept any treatment for it. She chose not to follow up with me either. I only saw her twice. Perhaps it was fear for her job, social isolation, or a cultural factor. Perhaps it was the anxiety itself. Whatever the reason, despite having severe ongoing symptoms, she could not accept that she was mentally ill. She was a victim twice over, suffering from both mental illness, and its stigma. Unfortunately, this young lady is not an isolated case. Stigma follows mental illness like a shadow, an extra layer of unnecessary suffering, delaying proper diagnosis and treatment of diseases that respond best to early intervention. What contributes to the stigma of mental illness? Fundamentally, the stigma of mental illness is based on ignorance. Ignorance breeds stereotypes, stereotypes give rise to prejudice, and prejudice results in discrimination. This ignorance usually takes three main forms; people with mental illness are homicidal maniacs who need to be feared; they have childlike perceptions of the world that should be marveled; or they are responsible for their illness because they have weak character . Dr Caroline Leaf is a communication pathologist and self-titled cognitive neuroscientist. It’s disturbing enough that Dr Leaf, who did not train in cognitive neuroscience, medicine or psychology, can stand up in front of people and lecture as an “expert” in mental health. It’s even more disturbing when her views on mental health are antiquated and inane. Today’s post, for example. Suggesting that psychiatric labels lock people in to mental ill-health is like saying that a medical diagnosis locks them into physical ill-health. It’s a nonsense. Does diagnosing someone with cancer lock them into cancer? It’s the opposite, isn’t it? Once the correct diagnosis is made, a person with cancer can receive the correct treatment. Failing to label the symptoms correctly simply allows the disease to continue unabated. Mental illness is no different. A correct label opens the door to the correct treatment. Avoiding a label only results in an untreated illness, and more unnecessary suffering. Dr Leaf’s suggestion that psychiatric labels lock people in to their illness is born out of a misguided belief about the power of words over our thoughts and our health in general, an echo of the pseudo-science of neuro-linguistic programming. The second part of her post, that “recognizing the mind can lead us into trouble and that our mind is powerful enough to lead us out frees us” is also baseless. Her assumptions, that thought is the main driving force that controls our lives, and that fixing our thought patterns fixes our physical and psychological health, are fundamental to all of her teaching. I won’t go into it again here, but further information on how Dr Leaf’s theory of toxic thinking contradicts basic neuroscience can be found in a number of my blogs, and in the second half of my book . I’ve also written on 2 Timothy 1:7 before, another of Dr Leaf’s favourite scriptures, a verse whose meaning has nothing to do with mental health, but seized upon by Dr Leaf because one English translation of the original Greek uses the words “a sound mind”. So Dr Leaf believes that labelling someone as having a mental illness will lock them into that illness, an outdated, unscientific and purely illogical notion that is only going to increase the stigma of mental illness. 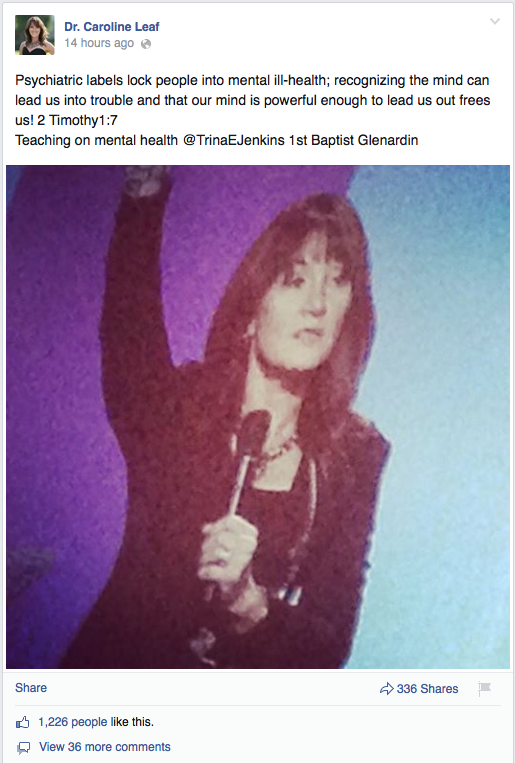 If I were @TrinaEJenkins and the good parishioners of 1st Baptist Glenardin, I would be asking for my money back. With due respect, and in all seriousness, the stigma of mental illness is already disproportionate. Mental illness can cause insurmountable suffering, and sometimes death, to those who are afflicted by it. The Christian church does not need misinformation compounding the suffering for those affected by poor mental health. Dr Leaf should not be lecturing anyone on mental health until she has been properly credentialed. This entry was posted in Biological, Caroline Leaf, Psychological, Spiritual and tagged 1st Baptist Glenardin, 2 Timothy 1:7, anger, anxiety, bible, brain, caffeine, cancer, caroline, caroline leaf, cognitive neuroscientist, criticism, diagnosis, discrimination, dr caroline leaf, Dr Leaf, Facebook, fear, GAD, generalised anxiety, generalised anxiety disorder, ignorance, isolation, label, Leaf, meme, mental health, mental illness, neuro-linguistic programming, neurobiology, NLP, prejudice, pseudoscience, psychiatric, psychologist, psychology, skeptic, skepticism, sound mind, stereotype, stigma, stress, suffering, thought, toxic thought, treatment, Trina E. Jenkins, weak, weak character, weakness by cedwardpitt. Bookmark the permalink. I responded in a similar way on this Dr Leaf post. I also responded to other posters who seemed to me to have “drank the cool aid.” I offered to speak directly with Dr Leaf at my expense wherever in the world she was. All of my posts were deleted and now I have been excluded from commenting on the page anymore. This prompted me to look in to Dr Leaf only to learn she is a speech pathologist calling herself a cognitive neuroscientist. I’m beyond outraged and at a loss to what to do. Thanks for the comment Di. I can understand your frustration. I have had the same experience with Dr Leaf’s Facebook team, and I have seen a couple of other respectfully dissenting comments deleted for no reason other than they disagree with her. I’ve also been banned from commenting on her Facebook feed because I disagree with her posts. In my personal opinion, it’s concerning and not particularly honest on her part if all she allows is favourable comments, though it’s her page so she can present it how she likes, and the rest of the world can make up its own mind. As for what to do, I can only encourage you to make your voice heard. Have a look at her books or website, and respectfully make your concerns known to both your friends, and the national executive for the church organisation you are a part of (if indeed, you are a part of a church). You’re welcome to reference this blog or my book if you wish. Make your voice heard, respectfully and consistently. With time and persistence, the truth will come through. Good luck.